It's never been easier to bring education to life with an iPad. Portability, interactive technology and the sheer range of learning materials has made tablet-based learning a great way to teach and inspire students. But before you can do that, you first need to get devices into the hands of your students. So how do you get up and running? Before you even get to anything Apple-related, you'll want to make sure that your IT infrastructure is robust enough to support the deployment of multiple iPad devices. There are three key elements to prepare at the outset: your network, your MDM solution and your student information system. It starts with the network. Ensure that you have a reliable Wi-Fi network with (a) sufficient coverage and (b) sufficient capacity to handle the rollout. iPad-based learning is heavily dependent on consistent and reliable network access, so make sure that yours can handle simultaneous connections from all students in all the locations that an iPad will be used. You'll probably want to put in place suitable caching measures to help reduce internet bandwidth and speed up software installations (including those hefty Apple software updates). Use enterprise-class Wi-Fi gear for your infrastructure. Later on, once a device is enrolled, you'll be able to use your MDM service over the network to configure settings and perform other tasks on individual iPads without the end user/student needing to be involved. You should back up your MDM server regularly and confirm that your backups can be successfully restored if need be. Contact your MDM vendor if you need help with this. Many schools and education authorities use a student information system to manage student data including enrolment and class registers. Contact your SIS provider to find out about its integration with Apple School Manager. You should also take this opportunity to check that your class register data is up-to-date. Later on you will be able to import SIS register data into Apple School Manager to create Managed Apple IDs and set up the Classroom app. 2. Enrol in Apple School Manager. Apple School Manager is the central hub of iPad deployment. It's a secure web-based portal that lets you manage people, devices and content. You can access it from anywhere by logging in with your Apple ID. 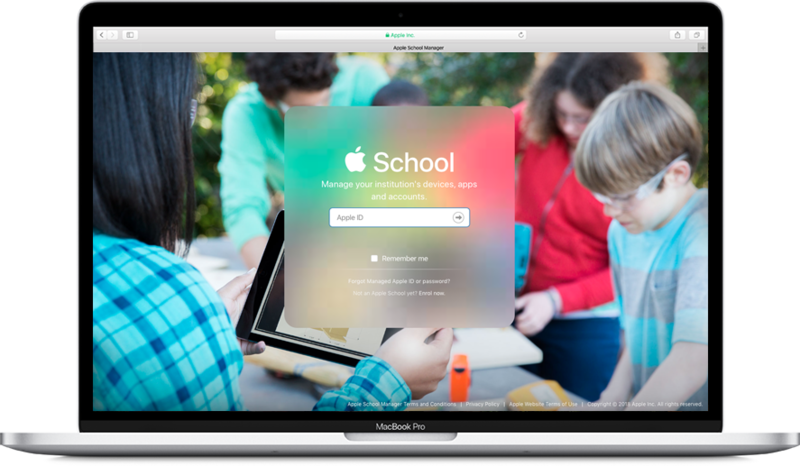 From Apple School Manager you can carry out important tasks such as creating accounts for students and staff, enrolling devices into your MDM system, and purchasing apps and books. To enrol in Apple School Manager, visit https://school.apple.com, click Enrol now and enter the required information. During the review process, the verification user will be contacted by phone or email and asked to provide additional information before your application can be approved. Detailed enrolment instructions can be found here. 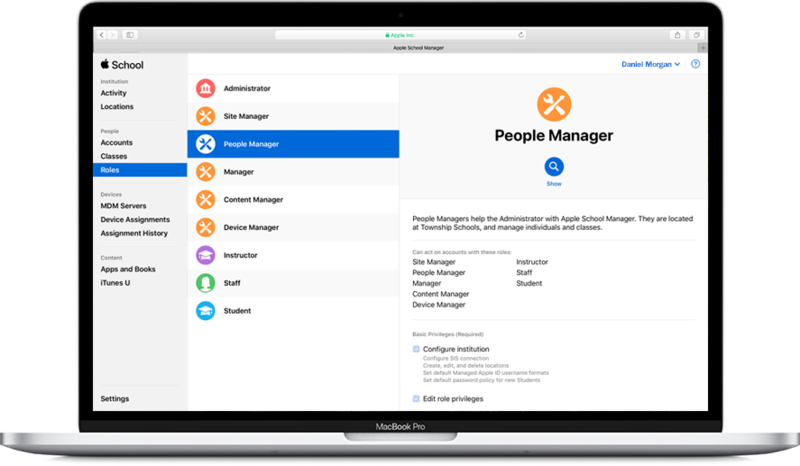 Note: If you enrolled in Apple Deployment Programmes on or after 26 February 2014, your school may be able to upgrade to Apple School Manager. 3. Create Managed Apple IDs for students and staff. The next step is to create accounts for your students and staff so that they can make the most of the full range of Apple services. These accounts - known as Managed Apple IDs - are a special education-only type of Apple account with education-specific features enabled but other features disabled to protect the personal information of students and teachers. A Managed Apple ID enables students and staff to personalise their devices and access key services such as the Schoolwork app, iCloud and more, all while meeting the privacy and security needs of your school or local authority. Apple School Manager integrates directly with popular Student Information System (SIS) providers including SunGard, Infinite Campus and PowerSchool. More information on SIS integration can be found on this page of Apple's website. It's also possible to import register data automatically using a Secure File Transfer Protocol (SFTP) integration provided by your school or a wide range of SIS providers. Follow the instructions on this page of Apple's website to use this method. Once Managed Apple IDs have been set up, you will be able to assign different roles, audit user accounts and reset passwords. 4. Set up the devices. To deploy Apple devices that your school has purchased either directly from Apple or from a participating Apple Authorised Reseller, you'll need to add at least one mobile device management (MDM) server in Apple School Manager. Once you have linked one or more MDM servers to your account, you can associate specific devices to one of those servers. You can then use MDM to assign devices to your students, teachers or class groups. With devices activated, any MDM-specified configurations, restrictions or controls are automatically applied without you ever needing to physically touch or prepare the devices before students receive them. MDM can be used to wirelessly reconfigure Home screen layouts, show or hide specific apps and apply restrictions as per your school's requirements. You can also use it to schedule software updates and locate misplaced devices. Students each having their own iPad is a convenient way to teach, but there may be occasions where you need a single iPad to be shared between multiple students. Apple provide a feature called Shared iPad for this purpose. It enables you to share devices between students while still giving them a personalised experience. This is something that can be set up in Apple School Manager. Once you have assigned a shared iPad to a student, their picture will be added to the Lock screen and they will be able to access their personal content using a password or 4-digit PIN. Bear in mind that a local copy of their data will be stored on this device, so after they log in, their homework and assignments will be exactly as they left them. Read more about optimising apps for Shared iPad on Apple's website. 5. Deploy apps and content. 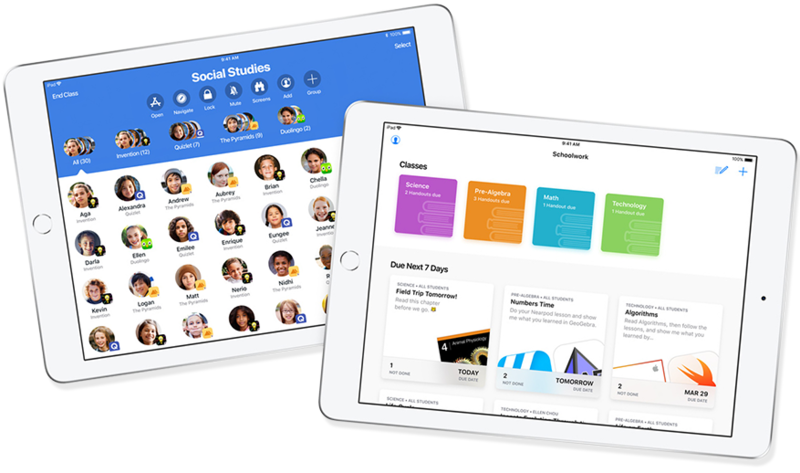 The App Store and iBooks Store are both available from within Apple School Manager, giving teachers access to thousands of educational resources without the bother of switching applications or navigating across multiple logins and tabs. Click on the Apps and Books area of Apple School Manager and from there you'll be able to search for learning materials, purchase licences (with your education volume discount) and see at a glance the licences you have currently assigned. After you have set up student accounts and class registers in Apple School Manager, classes are automatically made available in the the Classroom and Schoolwork apps, so teachers can get started immediately. The Schoolwork app gives teachers the ability to assign worksheets and activities in educational apps and also allows teachers to follow students' progress and collaborate with them in real time. Schoolwork is automatically updated as students move in and out of classes in Apple School Manager. It's also possible to create classes in Apple School Manager manually and you can allow teachers to create, edit and delete classes for their locations. If you want to track student progress, you can activate Student Progress for Schoolwork from the settings area of Apple School Manager (or disable this feature for individual students in the Accounts area). If you have Apple TV, this can be enrolled and configured in MDM by plugging in power and Ethernet cables. You can use the name, network and even use Conference Room Display Mode with a custom message. What happens if I don't set up Apple IDs? It's still possible to deploy iPads and Macs without an Apple ID, however you won't be able to use the key services. In this instance, the students will just need to switch on the device and no sign-in is required. Managed Apple IDs can always be created at a later stage if required. Are my student details safe? If you have any questions about charging and storage solutions for multiple iPads, we'd be happy to help. Our products are used in schools across the UK and we also create products for charging other makes of tablet too, along with laptops, smartphones and smartwatches. To find out how your school can benefit, get in touch with us using the form at the bottom of this page.